Wixarika leaders are welcoming a new government proposal to declare a Biosphere Reserve in Wirikuta. However, they warn of inconsistencies and dangerous propaganda that is being instigated by First Majestic Silver, the Canadian mining company that wants to gut the Sacred Territory of the Wixárika (Huichol) people. Once again they demand to be included in the process as the government prepares to issue a final decree. THE WIXARIKA REGIONAL COUNCIL FOR THE DEFENSE OF WIRIKUTA (CRW) AND THE FRONT IN DEFENSE OF WIRIKUTA (FDW) WELCOME A BIOSPHERE RESERVE DECREE WHICH RESPECTS AND PROTECTS OUR BIOCULTURAL HERITAGE, WHERE ANY MINING ACTIVITY IS PROHIBITED AND WHICH RECOGNIZES THE HUMAN RIGHTS OF OUR PEOPLE AND OUR BROTHERS THE FARMERS AND INHABITANTS OF WIRIKUTA. We the Wixaritari traditional authorities, civil and agrarian communities Waut+a-San Sebastián Teponahuaxtlán, Tuapurie-Santa Catarina Cuexcomatitlán, Muyewe Uweni Bancos de San Hipólito, who are integrated as the Wixárika Regional Council for the Defense of Wirikuta, wish to make known that in our communities we have held an internal consultation about the defense of our sacred ceremonial Wirikuta territory, which is threatened by aggressive mining and agribusiness projects. 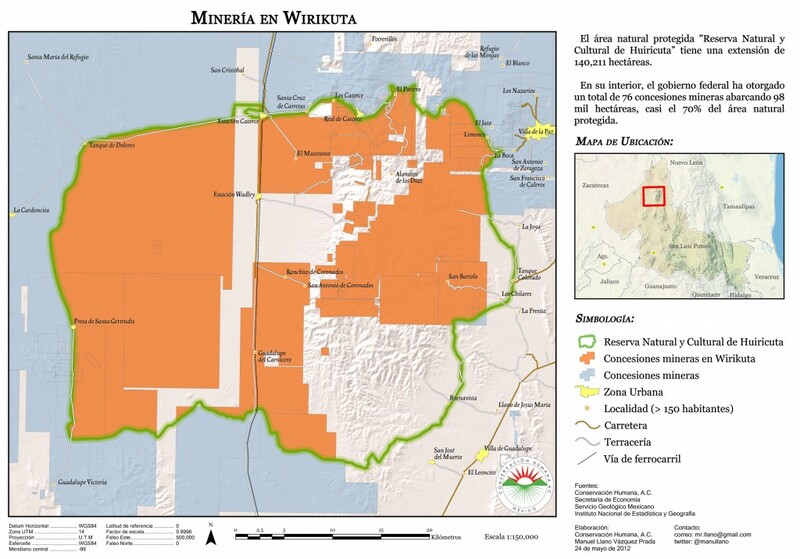 We recall that on September 28, 2012, the National Human Rights Commission issued Recommendation 56/2012 on recognizing the collective cultural and territorial violation of human rights of the Wixárika People and the mestizos that inhabit the Wirikuta ejidos. Also that through judicial proceedings brought by our people, the mining project known as La Luz, which seeks to exploit the minerals of the Sierra de Catorce, remains suspended. We recall our irrenounceable demand all existing concessions be cancelled on the more than 140,000 hectares covering the currently decreed State Ecological Reserve. On 15 October 2012, the Secretariat of Environment and Natural Resources (SEMARNAT) published the Previous Justification Study to declare the area known as Wirikuta, in San Luis Potosi, a Natural Protected Area (ANP) with the designation of Biosphere Reserve, covering an area of 191,504 hectares, located in the municipalities of Catorce, Cedral, Charcas, Matehuala, Vanegas, Villa de Guadalupe and Villa de la Paz, San Luis Potosi, which according to current legislation is open for a consultation period of 30 calendar days. That on October 26, COFEMER published the draft decree of the Biosphere Reserve of Wirikuta, which divides the ANP into core and buffer areas, which explicitly prohibits exploration and mining, and also opens a consultation period for its approval. We recognize and welcome the measures taken by the federal government, particularly in relation to the draft decree issued by COFEMER. However, we are convinced that the Biosphere Reserve decree must be based on human rights recognized by national and international law, and specifically those who recognize the particularities of indigenous populations, because only in this way will be guaranteed that the collective word of our people and the inhabitants of the area, will be considered in its true dimensions for management decisions in the area. We flatly reject the existence of special use buffer zones to allow mining and metallurgical activities on the living territory of Wirikuta, the explicit plan of the Technical Justification Study, as the proper use of these lands is not exploitation but the maintenance of the balance of life. In this regard we note that we will reject any decree that means a regression on this topic with respect to the draft submitted to COFEMER, because it would be a betrayal of our people and the entire nation. Implementing a Biocultural Reserve should take into account the needs of the population of the area, providing support for their development and well-being from the perspective of sustainability of the valuable habitat that is Wirikuta, caring for future generations. In this sense, the implementation of the reserve must be done in a gradual process of adoption of sustainable forms of production protected and guaranteed by the State including the complete regeneration and preservation of habitat and a decent standard of living for its inhabitants with full respect for the cultural heritage of our people. In this sense, it is not acceptable that the government give in to the pressures of economic and political powers, which have unleashed a campaign of terror among those living in communities in the area, saying that because of us they will lose their land and no longer be allowed any work. This campaign been driven by local political officials led by First Majestic Silver Corp. and its subsidiary Minera Real Bonanza. This is very dangerous and we wish to make it known now that any incident against us will be due to these illegal actions to stoke violence. We have seen also that the Chamber of the Mining Industry has paid for insertions in newspapers defending their alleged development for the local inhabitants, when what they offer is the destruction of ecosystems and of the future of its people. The federal government knows this; its specialized agencies such as CONANP and leading scientists of the country clearly indicate that it would be the greatest inconsistency to raise a Biosphere Reserve in Wirikuta with permission for mining. The government should stand up for this. We demand that the core areas Tatei Matiniere and T+i Maye’uu be recognized, as well as the creation of corridors to protect all along the pilgrimage route. These are agreed to in the state decree but are excluded from the federal decree. We demand as the fundamental basis of the decree of Biosphere Biocultural Reserve to guarantee the free movement and observation of the calendars of the Wixaritari pilgrimages in the entire ANP, and the gathering based on traditional criteria of our sacred plants such as Hikuri, Uuxa, bird feathers, etc., given that our people have made a steady and sustainable use for thousands of years of these living elements that maintain constant communication with our people. We require the effective participation of the Wixárika communities in every stage of implementation, research and management of the ANP. We call on the country’s indigenous peoples, to the organized civil society in resistance, to the conscious and supportive students, to the scientific, art and cultural communities, to remain attentive to the protests, campaigns and urgent actions at the national and international level, proposed by the Front for the Defense of Wirikuta Tamatsima Wahaa. The Wixárika people demand not to be betrayed by decreeing a Natural Protected Area that permits mining. As we remind you, what is at stake is not small, Wirikuta’s destruction is our spiritual death and is the destruction of the balance of the universe. We reserve all of our rights until we see the final decree that the federal government finally decides to issue. FOR MORE INFORMATION< ajagi1@prodigy.net.mxAlso, visit the website of the Wirikuta Defense Front: www.frenteendefensadewirikuta.org (English/Spanish). Thanks to Tracy Barnett for the Translation.